Amish communities cover Indiana from north to south across the state. Indiana Amish roofing companies providing services such as new roofing, shingle repair, roof replacement, metal roofing and more can be found in many Hoosier settlements. Use the listings below to locate an Amish roofer near you. Below you’ll find some of the Amish roofing contractors in Indiana. Many of these companies are Amish-owned and run; some may be non-Amish owned but employ Amish workers. Some Amish-owned companies maintain websites with assistance from non-Amish parties. Please contact businesses directly for most current information. To add your business to this list, please send an email with business address, contact, and 2-4 lines describing your roofing and other services. For other Amish roof repair contractors, check the Amish roofing main page. The Indianapolis-area Amish settlement at Milroy (Rush County) is home to a number of Amish construction companies. Amish from other communities including near Fort Wayne also do work in the greater Indianapolis area (see Fort Wayne Amish roofer listings). Provides roofing services in addition to building pole barns, garages, and doing siding work. Old barn repair, fencing, porches, decks, carports, and remodeling work. The Allen County (Grabill) Amish community lies just outside the municipal limits of Fort Wayne. The construction industry is big here, with many Amish contractors making their homes in this settlement. Amish roofers from this community do work in the Fort Wayne area as well as in other cities and regions, including into Ohio and parts of Indianapolis. Amish-owned contractor specializing in new roofs, re-roofing, remodeling, additions, outdoor structures such as pergolas, pole buildings, garages, barns and decks; also does concrete work. Coverage areas include Fort Wayne, Central Indiana, northeast Indianapolis, Auburn, and NW Ohio. Amish Roofing Contractors has been in operation for over 3 decades, specializing in roof work in the New Haven area. This company provide service including new roof installation and roof repair, including post-hurricane reconstruction and minor jobs. Fully licensed and insured. SJS offers services including roofing, siding, pole barn construction, home additions, renovations, and new home construction, as well as concrete work including decorative concrete and stamped concrete. Provides roofing services to Fort Wayne, New Haven, Georgetown, Cedarville, Auburn, Grabill, and adjacent areas within Indiana. The largest Amish presence in Indiana is found in Elkhart and Lagrange counties, with another sizable settlement a stone’s throw away around the town of Nappanee. Amish roofers in this community do work in Indiana cities as well as in southern Michigan. Amish typically travel up to a 2-hour’s drive from their home settlements for work (and sometimes further, if staying overnight). Amish-owned business specializing in metal roofs but doing other construction as well, including re-roofing, roof repair, windows, sheds, leak repair. Free estimates. Amish have a significant presence in southern Indiana, with communities in Orange, Switzerland, and Washington counties. However the largest Amish community in this part of the state is found in Daviess County (Odon-Montgomery area), home to over 3000 Amish and numerous building companies, including Amish roofers. Amish from the Daviess County settlement service cities and regions including Bloomington, Evansville, southern Indiana, and the greater Louisville, Kentucky area. Amish Building offers professional building services provided by Amish craftsmen. They do roofing work (commercial and residential full service), window installation, remodeling, additions and more. Located in the southern Indiana Daviess County community, this company provides building services across the Midwest U.S. region as well. Why choose an Amish roofer? Indiana homeowners have found Amish roofers to be a good choice for a number of reasons. Amish roofing contractors generally enjoy a good reputation for work done well, and in a timely manner. Amish roofers are also generally competitively priced. 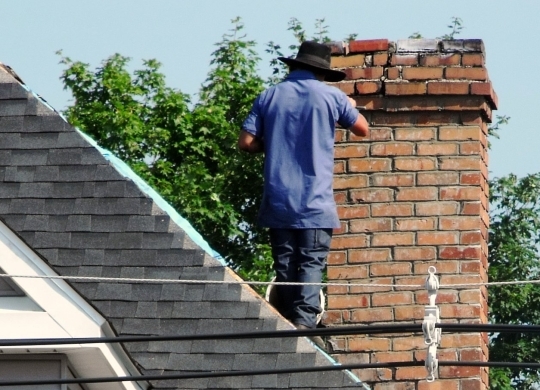 You may want to check that your roofer is insured and licensed as not all Amish roofers necessarily carry insurance. Amish roofers are generally able to work on-site using power tools as any other roofer would (the well-known Amish prohibition of public electricity mainly focuses on the home). Amish crews are often driven by non-Amish employees who provide a work vehicle or operate one leased by the Amish company. In other cases, the roofing company itself is owned by a non-Amish person, who simply employs Amish workers. As Indiana is home to America’s third-greatest Amish population, Indiana residents also have the advantage of proximity in being able to find an Amish roofing provider within a reasonable distance of home. Read more on the Amish in Indiana. The barn that was wind damaged is located in New Palestine, IN. Phil I would recommend contacting someone from this list yourself. This is a directory of Amish roofing businesses, not the website for any one particular business. It’s possible they may see your message and contact you, but for best results try to get in touch yourself. Good luck! I am looking for someone to build our deck. We have some (quite a bit) of douglas fir we were hoping to use only thing is all all tongue and groove. I bought it for a remodel of our stairs and floor for inside the house and have a bunch left over. We live in St Joseph, Mi. Looking for someone to paint and fix leaks on a 100 pluse year old barn. Very steep roof. Haubstadt Indiana area. Need somebody that’s going to do a good job. Hello. I need help finding some one who has knowledge and experience with Barrel Barn Truss repair. This isn’t your normal Truss. Its a wish bone construction, on site built, laminate style truss system. No cords. I am not even sure what to call it. Barrel Vault Truss maybe but the entire truss is vaulted and gives the barrel its shape. I have many pictures if I could have an email to send them to. We can do the roof, we need someone to make the trusses. The customer’s dad built this Barn in the 1940’s and a tree fell on it. He said that 11 years ago an Amish roofer restored the barn, remade the trusses. He believes he is no longer around and can not be found. Please help with any information. I am a home owner in Franklin. I have an oak tree that I need to remove but want to use the good wood in the base to allow a professional help us decide on furniture to be made from said tree. The arborist has agreed to leave as much of trunk should it be worthy. Can you direct me in any contact or group of professionals that might be interested in working with me. My time line is end of July 2015.
of loose or separated edges is to figure out if the problem is a set of loose nails. In many cases, the repairs can be relatively inexpensive. Looking for a roofing estimate to have trusses added to front of house and replace shingles with a metal roof. I am looking for someone that can give me an estimate for replace the existing roof and a couple of the boards the shingles are attached to. I am looking at having the work done ASAP as we have 3 leaks as it is. 16×80 mobile home in New Castle, Indiana. I am looking to get a total roof and gutter replacement estimate in Jeffersonville.